Jesus said, "Someone deliberately touched me, for I felt healing power go out from me." When the woman realized that she could not stay hidden, she began to tremble and fell to her knees in front of him. The whole crowd heard her explain why she had touched him and that she had been immediately healed. "Daughter," he said to her, "your faith has made you well. Go in peace" (Luke 8:46-48). Why did Jesus "call out" this woman? This unnamed woman had received her miracle. She had been made whole when she touched the fringe of his robe. She had wanted to remain anonymous. Her years of nightmare, separation, and embarrassment were finally over. (Under Old Testament Law, a woman with a flow of blood could not go into public places, not even the Temple to worship.) So why did Jesus force this woman out of her private moment of healing for her highly embarrassing physical problem into the light of public scrutiny? Jesus was giving this woman the grace of affirmation for faith and the declaration that she should be accepted back into public life as a whole person. Jesus was giving this lady the grace of fellowship, acceptance, and community. We live in a time where western Christianity has privatized and so personalized faith that we've lost the necessary grace of community connections, acceptance, and involvement. "Have you accepted Jesus as your personal Lord and Savior?" This has become our litmus test. Yet this language, this question, this prescription is never found in Scripture. This statement is never made a requirement for salvation in the Bible. Check. You won't find this "personal" language anywhere. "Pray this prayer with me and ask Jesus into your heart and you will be saved." Again, not found in Scripture. Never required in the New Testament. Not given as an answer on how to be saved in the New Testament. Conversion was not a private and individual matter in the New Testament. On the day of Pentecost — the day when people were first saved after Jesus' death, burial, resurrection, and appearances — the people believed Peter's message that Jesus was "both Lord and Christ" then called on the name of Jesus to be their Lord by being baptized in his name. They were then added to Jesus' church that day (Acts 2:33-41). This new group of disciples immediately formed a new and vibrant family of believers that shared in life together (Acts 2:42-47). I tell you, whoever publicly acknowledges me before others, the Son of Man will also acknowledge before the angels of God (Luke 12:8). So throughout the book of Acts, we see groups of people become followers of Jesus together and in front of each other. Notable examples are the Samaritans in Acts chapter 8, Cornelius in Acts chapter 10, as well as Lydia and her household and the Philippian jailer and his household in Acts chapter 16. In each situation, the people who were saved confessed Christ and were baptized in the presence of and with the support of others. Why was this the apostles' method of sharing Jesus and calling people to conversion? They learned it from Jesus. They learned this from Jesus' own baptism before others (Luke 3:21-22), his parting command we call the Great Commission (Matthew 28:19-20) and also from his example of publicly affirming and restoring people back into community after healing them or freeing them from demons. And that is what Jesus did with this woman who touched his robe and whom he called out of hiding so he could speak to her before the crowd. Jesus loved us enough to not only give us the grace of salvation from sin but to also save us into a family that will welcome us into fellowship and help us in our life of faith. Jesus called this healed woman out from the crowd not to embarrass her, but to affirm her faith, confirm her healing, and declare her clean and ready to be received back into the community as a whole person. When Jesus gave her the blessing, "Daughter, your faith has healed you. Go in peace" (Luke 8:49), he was affirming her and declaring her whole. The word "peace" comes from the Jewish blessing, shalom. This word speaks to a person's wholeness and holiness before God and in his community of people. 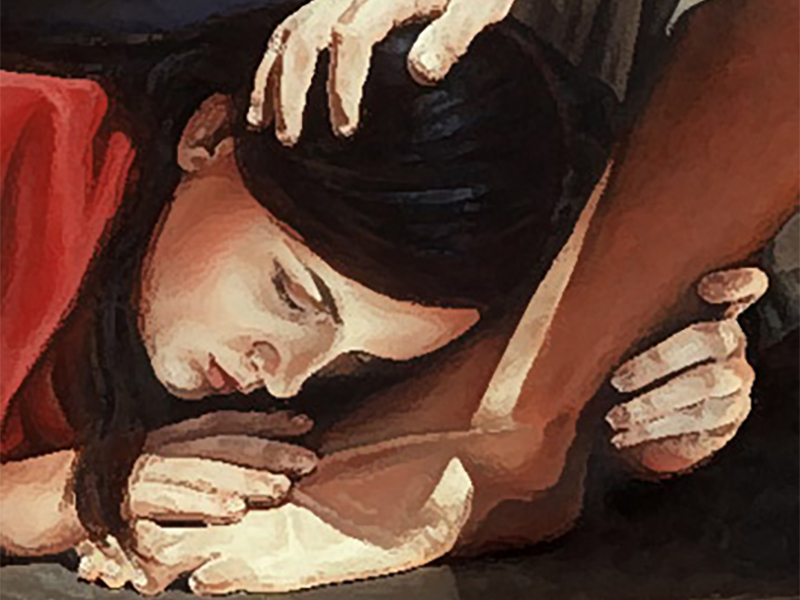 Jesus gives a similar affirmation and blessing for the woman who had demonstrated great love to him by washing his feet with her tears and hair, declaring that she loved greatly because she had been forgiven much (Luke 7:44-50). Jesus commands a man whom he healed of leprosy to do the things that would bring him back into a life of acceptance and wholeness in community by going and showing his healing to the priests (Luke 5:12-14). Each of these reminds us of the forgotten grace of Jesus to affirm, confirm, and declare people his whole and holy followers, fully accepted by God. Jesus' example, Jesus' teaching, and the practice of the early church remind us that we must not forget the grace of Jesus to give us a spiritual family. This spiritual family is the place where we can publicly confess our faith and call on the Lord for salvation, the community where we are publicly baptized, the group of loving people who will affirm us in our salvation, and the community where we begin to live our new life in Jesus with support and encouragement. Jesus loved us enough to not only give us the grace of salvation from sin but to also save us into a family that will welcome us into fellowship and help us in our life of faith. Can we offer people anything less than this and call ourselves Jesus' disciples? Attempts have been made to identify the source and artist for the images at the beginning of this article. The middle images come from Free Bible Images and courtesy of The Lumo Project. "A Forgotten, but Necessary, Grace of Jesus" by Phil Ware is licensed under a Creative Commons License. Heartlight encourages you to share this material with others in church bulletins, personal emails, and other non-commercial uses. Please see our Usage Guidelines for more information.